Let me start this post off by saying that Antarctica for me was a 15-year long bucket list item, it was also the most amazing vacation I have ever been on. After years of research and trying to work out a cost effective way to reach my 7th continent it became clear that you either pay a considerable sum of money or you don’t go. I researched quite a few companies that offer cruises to the white continent including National Geographic, Quark and Hurtigruten. While National Geographic is at the upper end of the price spectrum it’s not ridiculously more expensive than the others, and in my opinion includes a lot more. Cruising Nat Geo is an all rounded experience from the quality of the staff, the Captain of the boat, the cabins, the food and the excursions everything is executed perfectly to leave you with the most enjoyable experience you can imagine. I paid $30,500 for 2 adults, this was for the second cheapest cabin available, don’t be fooled it doesn’t mean it’s any less luxurious than the rest. In fact I think it’s one of the nicest cabins I have ever had on a cruise ship, see for yourself. Upon arrival in Buenos Aries you will check-in to the Sofitel Hotel where a brunch is served in the dining room. You will be given a lot of information regarding the cruise and that night there is a special welcome cocktail hour and briefing that you must attend. During the day there is a free walking tour and bus tour available. Today is a very early day, you will be woken up around 6am, provided a full buffet breakfast and then driven to the domestic airport, which is only 20 minutes away from the hotel. At the airport you will board your charter flight with LATAM to Ushuaia. The flight takes about 3.5 hours and you will be given a light snack on-board. Once you arrive in Ushuaia you will take a bus through town to Tierra Del Fuego National Park, where you will board a catamaran for a 3 course meal while it cruises down the Beagle Chanel. After lunch the boat will dock and you will board the National Geographic Explorer or Orion depending on what ship you booked. The friendly staff will be there to greet you and show you to your cabins, you will then have the opportunity to explore the ship. Today you will spend the entire day at sea crossing the Drake Passage, a 580-mile-wide swath of Ocean that divides Antarctica from South America. This patch of ocean is notorious for having giant swells so take your sea sickness tablets, strap in and enjoy the ride. We were very fortunate and the sea remained calm with rolling swells that gently nudged the ship closer and closer to the Great White Continent. But don’t be fooled even with great conditions a good portion of the passengers were quite sea sick. Although you’re not on the continent yet don’t worry there is still lots of things to do on-board the ship. The best thing about cruising with Nat Geo is the endless educational entertainment they provide. From expert talks on birds, whales, and undersea life the boat always hosts a number of guest speakers. We were fortunate enough to have Peter Hillary on-board the son of Sir Edmond Hillary who was the first man to ever summit Mount Everest. He gave a number of talks throughout the cruise which were all fascinating and deeply captivating. In addition we had a Princeton Professor on-board who was an expert on ice sheets and gave several fascinating talks on how they weigh Antarctica from space and how the ice sheet is reacting to global climate change. Today is the day you will arrive in Antarctica, usually just after lunch time. Our first port of call was Half Moon Island in the South Shetland Island chain. The rugged beauty of these islands is punctuated by jagged islets and ice-capped peaks. After a short zodiac ride to shore you can choose to hang out in the penguin rookerie and watch these little guys go about their day or you can choose to hike about 1km up a hill to get a stunning view of Half Moon bay. After ½ a day on the island you will return to the ship for the daily recap and a three course dinner. Today was one of my favorite days on-board the National Geographic Explorer, mother nature turned it on and when we awoke we were greeted with blue skies and calm waters. It’s not every trip that the ship is able to explore the eastern side of the peninsula and into the Weddell Sea but thanks to ideal weather conditions and a flexible schedule that Nat Geo is known for it all worked out. Today we spent most of the day out on deck basking in the sun and watching the huge tabular icebergs float by. In the late afternoon we were alerted to the fact that there was a huge pod of Killer Whales quite close by, thanks to the fast acting of the bridge crew we managed to sail with these amazing whales for an hour. Day 6 for me was the best day of the cruise. With perfect skies, calm seas the captain navigated through the Gerlache Strait on route to Wilhelmina Bay. After arriving in the bay the Captain pushed through the fast ice and parked the ship there for the remainder of the afternoon. Once we disembarked onto the fast ice we were able to kayak around the bay and walk on the fast ice which was full of penguins and seals. After a light lunch we then started the inaugural “Antarctica Running Club” with Peter Hillary, his daughter and her best friend. Once we arrived back at the ship they announced it was time for the Polar Plunge, which basically involves jumping in the water that is -1.8 degrees Celsius. People have asked me what it felt like but its so hard to describe, the cold hits you like a thousand needles, not going to lie there was a lot of screaming involved. After we had spent 40 minutes in the hot shower thawing out the Captain announced that they had manage to spot an Emperor Penguin. Contrary to popular belief when you visit Antarctica you will not see Emperor Penguins as they breed in the harsh winter and quite far inland. If you are lucky like we were you may spot a solo penguin chilling on an ice-flow. Today we awoke in Port Lockroy, also known as the Penguin Post Office. The morning was spent viewing the Bransfield House and exploring the museum. In the afternoon the ship re-positioned itself to Paradise Harbor, a beautiful bay with colonies of Antarctic Cormorants and wildlife. In the evening the Captain drove through the Lemaire Channel, which is one of the most spectacular passages in all of the Antarctic Peninsula. During the night the tension was high on the bridge, due to significant encroachin ice in the Lemaire Channel. One of the great things about the Nat Geo Explorer is their Open Bridge Policy, which means you can enter the bridge whenever you like and speak to the Captain and crew. When we awoke we found ourselves in the Errera Channel, we spent the day exploring Danco Island on foot and in zodiacs. After lunch the hunt for whales was on the Captain headed for Dallman Bay off the North Coast of Anvers Island, an excited announcement came shortly after informing the passengers that some humpback whales had been spotted. When we arrived out on deck I don’t think anyone was prepared for the epic sight of a dozen or more humpbacks in a feeding frenzy. Today was our first official day setting foot on the continent of Antarctica. Although we had been enjoying the beauty, ice, ocean, wildlife and island geography for days we had yet to officially set foot on the continent. This morning my ultimate dream came true the ship docked in Neko Harbour, we took a zodiac and firmly set foot on Antarctica. Surrounded by a sea of Gentoo penguins we marched up the mountain to the highest view point. Sadly today mother nature was not cooperating and all we saw was fog but it didn’t matter, everyone was so happy to have made it. On the way back down to the ship, a few of us decided that instead of walking down the snow covered hill it would be more fun to slide. We therefore created the International Sledding Olympics. With lots of participants I am proud to say I took home Silver for Australia, New Zealand took home the gold and America walked away with the bronze. Back on the ship there was a sense of sadness watching the sun set on our last day in Antarctica. Today was a full day at sea, and crossing the Southern Ocean is always an exciting prospect and always a unique experience. We left Antarctica behind us and headed out into the low fog with a long slow swell beneath our feet. As the long day gave way to night, land was totally out of sight giving a 360 degree view of the horizon with no traces of people insight. Antarctica and the Southern Ocean are the only places left on earth where you can experience such solitude and oneness with the Natural World and that’s what makes it such a unique amazing experience. Any voyage to the Great White Continent is a complex undertaking weather conditions, wildlife sightings, and ice conditions all contribute to the success of an expedition. The best thing about cruising with Nat Geo is the fluidity of their schedule, they basically tell you the moment its published its almost useless, this flexibility allows them to take advantage of situations and truly provide an expedition like experience. Over the course of 10 days the amount that was covered was staggering, starting in the Shetland Islands, some of the youngest islands off the coast of Antarctica, we then ventured into the Weddell Sea, the cold and dry side of the peninsula. From there we moved to the wetter-snowier side and found amazing fast ice or sea ice attached to land that we were able to walk and run on. 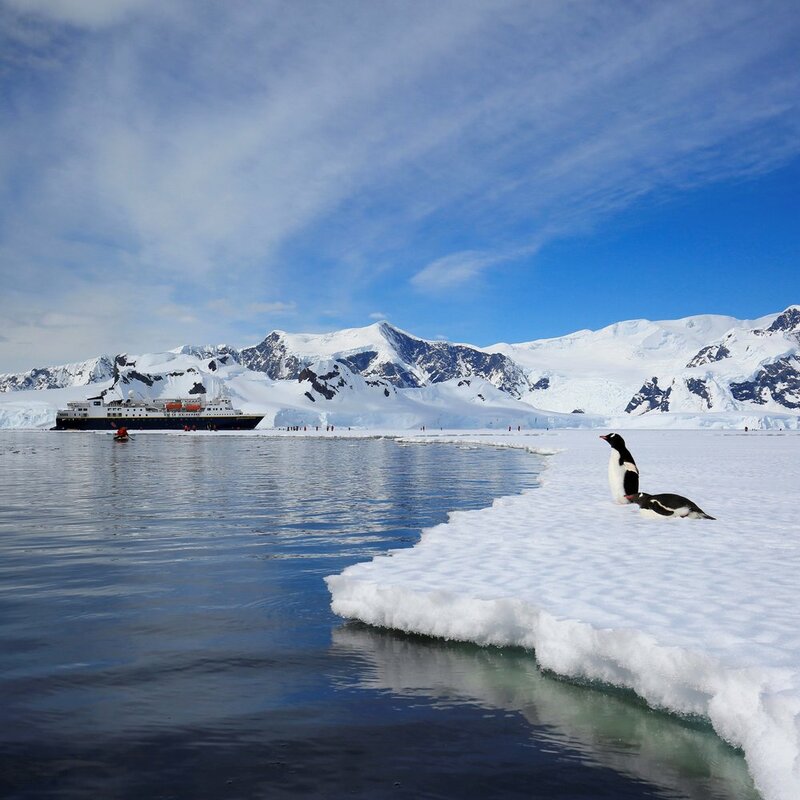 The ship then went further south to seek out the beautiful scenery of the Lemaire Channel followed by fruitful penguin and whale sightings. After 10 days at sea we headed back to Argentina crossing the Drake Passage and into the Beagle Channel made famous by Darwin's voyage on the channel's namesake. This experience can only be described as one of a kind, a truly unforgettable 2 weeks for which I will be forever thankful I was able to be a part of. Today you will disembark from the ship, head into town and spend the day perusing the shops and buying souvenirs. Mid-morning you will head to the meeting point in town enjoy a light morning tea and board the coaches bound for the airport. Boarding your charter flight is extremely sad and saying goodbye to new friends you have made on-board can be hard. But it just means there’s a new adventure to be had. If you enjoyed this post sign up below and receive notifications when I post new ones!